I offer Art Classes and workshops throughout the tri-state area at Arts Council of Princeton, Morven Museum, Grounds for Sculpture, Abington Arts Center, and Peters Valley School of American Craft. 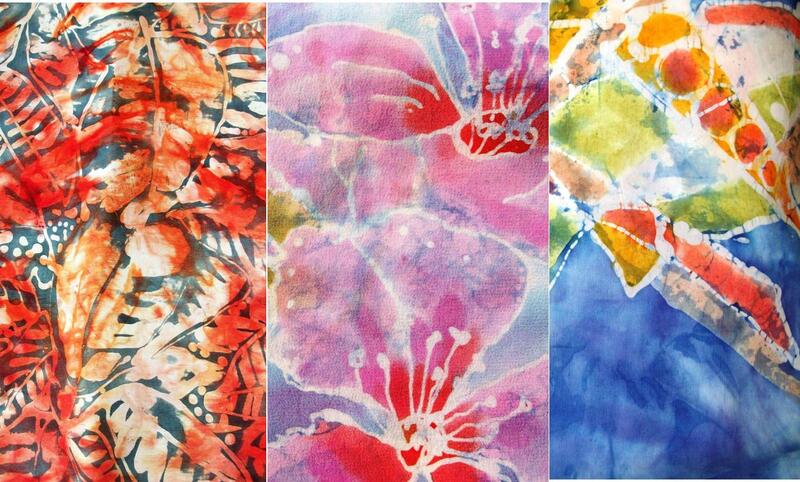 Wednesday, February 7, 6:00-9:00 pm Ambler Art Center $45 member | $55 nonmember (+ $35 materials fee payable to the instructor) Create 3 stunning silk scarves! Experience the process hands-on. The ancient art forms of Japanese Patterning (Shibori) and hand dyeing combine with today’s modern esthetic with Master Artisan Lian Sawires. Learn silk dyeing methods, pleating, and 4 patterning surface designs, blending traditional and modern techniques to synthesize a truly unique textile art. Valentine’s Day is coming... gift yourself. No prior experience needed. What you create will amaze you! Create free-standing sculptural forms, vessels, and relief pieces using fibers and heat tools. Recycled materials and man-made fibers are cut, shaped, and built-up with heat guns, irons and soldering irons, layering texture, color, and distressed surfaces. Build structure with Tyvek and bondable webs, create texture with foils, synthetic organza and more, add rich color with disburse dyes, and transfer paints, creating layered paintings, vessels and free-standing forms. Dive into working both large and small. Students will end their session with knowledge of hot textile tools and materials, and samples to inform future work, as well as several three-dimensional works. Beginner and up. Pre-registration is required [education@artscouncilofprinceton.org] and includes admission to Grounds For Sculpture for the artist. Ancient art form meets modern aesthetic in this Shibori hand dyeing workshop focused on blending traditional and modern techniques to synthesize a truly unique textile art. Work with master fiber artist Lian Sawires in adapting 5 shibori resist methods to create texture and patterns, while exploring 2 unique types of dyeing. Fiber Reactive and acid dyes interact differently with fabric, allowing you to achieve interesting and complex results. Overdyeing, discharging and dye blending take you to the next level resulting in a virtually unlimited surface design palette. Beginners and advanced textile artists will both find a wealth of inspiration and creative possibility in this full day shibori intensive. Bring a lunch and your own fabrics to add to the three silk scarves we will provide. What you create will amaze you! $35.00 material fee payable directly to the instructor. Registration is exclusively through the Arts Council of Princeton; for more information and to register, please visit www.artscouncilofprinceton.org. Membership rate applies to current members of either organization.